Grains are very important in our diet but not as important as Fruits and Veggies contrary to popular opinion. However, most of us have overindulged on just a couple of grains in our lifetime. Now it is true some have been incorporating multi-grain bread in their diet and starting to venture out eating other grains as well, but for the most part we have eaten wheat and lots of it. Wheat is not bad but since it is over used in our diets many people are developing sensitivities to the gluten in the wheat. In light of that I would like to highlight a grain you may have heard of or maybe this will be the first time and that grain is Quinoa (keen-wah). 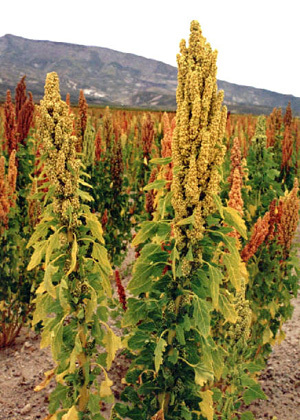 Quinoa is known as a superfood and revered as the mother grain by the Incas. It is packed with protein and contains all nine essential amino acids, including lysine, which is absent from most other grains. It provides a higher dose of iron, potassium and B vitamins than traditional grains. It digests well and is low on the glycemic index, high in fiber and free of gluten. There is a new cookbook out called “Quinoa 365: The Everyday Superfood” (Whitecap Books). It provides you with all kinds of amazing ways to use this powerhouse grain. If you have any questions or feed back or recipes of your own please comment below.